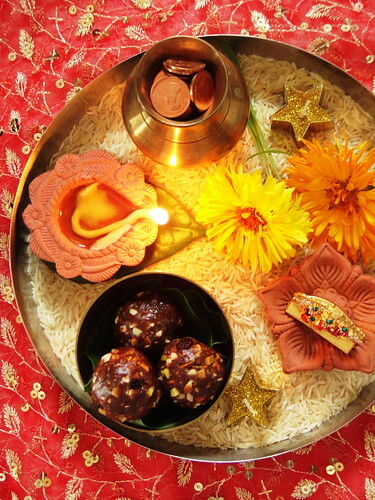 With Diwali just round the corner, I was hard pressed to do a post on an Indian mithai/ sweet and I could not think of a single one I had not yet blogged about over the past many years. 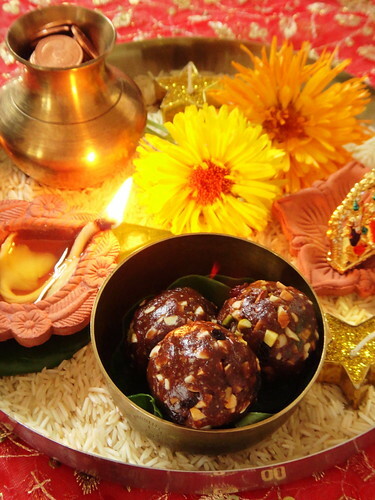 Besides the poor diabetes control rightly linked to the aftermath of this national festival of light [and sweets] convinced me to go for something healthier than the traditional burfi, gulab jamun or gato patate. 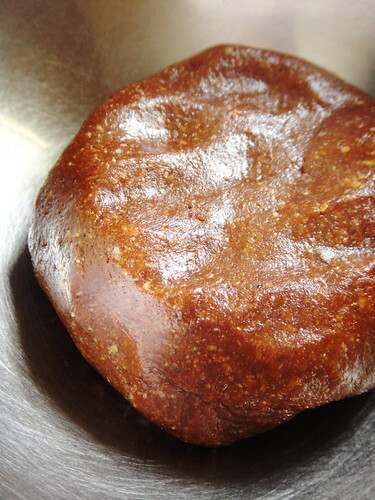 Here’s a big thumbs-up for the dry fruit laddoo, which restored my faith in the unique taste of this humble Indian sweet. Dates are the most important component in this no-cook recipe by FoodVedam as no extra sugar or sweetener is added. Try to use good quality dates of Medjool variety, if possible, as they are large and soft and therefore easier to process into a paste. 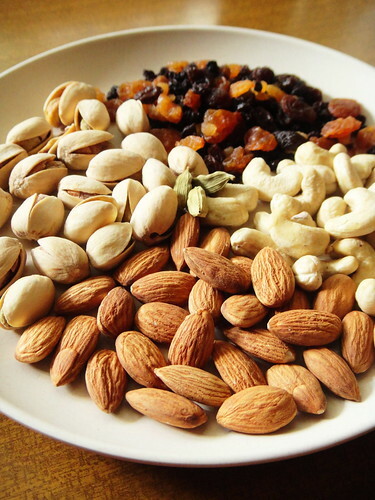 The shelling, roasting and chopping of the nuts should be done ahead as it is the most time-consuming step. 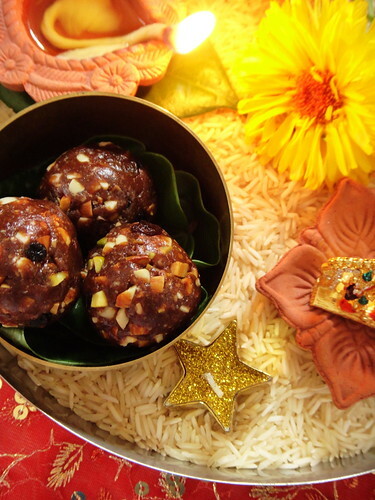 Once you have the nut mixture ready, the assembly hardly takes 15 minutes and you have a deliciously different laddoo to add to your sweet box and share with your loved ones on the blessed occasion of Diwali, Festival of Lights. Remove seeds from the dates and chop them coarsely. Chop dried figs and keep them aside separately. 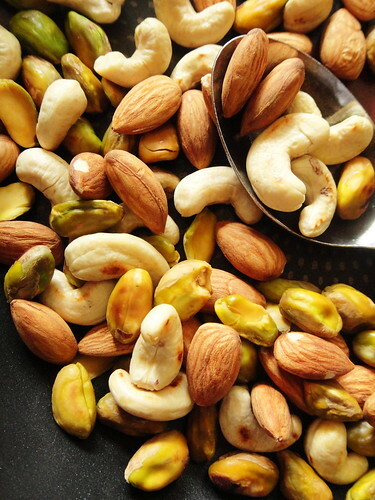 Coarsely chop almonds, cashew nuts, pistachios. Grind cardamom seeds and nutmeg to a fine powder. Put chopped dates and dried figs in a mixer grinder and make into a coarse paste. Melt ghee in a pan. 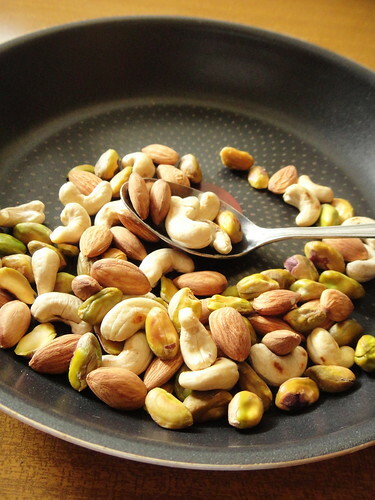 Add cashew nuts, almonds, pistachios, raisins and roast for 2 to 3 minutes. Add dates and figs mixture. 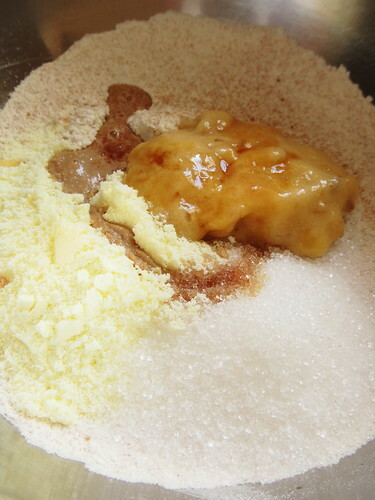 Stir in nutmeg powder, sesame seeds and mix well. Turn off flame and let it cool down for few minutes. Divide mixture into equal parts. 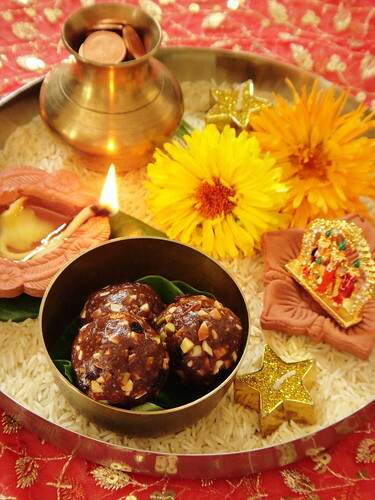 Apply a little ghee to palms each time to bind laddoos. For 12 pieces. This October, Nestlé is running a 21-Day Breakfast Challenge to promote their products as well as to encourage people to invest more time and effort in making breakfast part of their morning routine. Nestlé products should feature in the selfies posted on their Facebook album. Though I am not into this selfie madness, I was fueled by the excitement of a new challenge and decided to tackle it in my own way: To bake the 21 breakfast recipes in the Nestle recipe book and post one recipe per day on my blog. 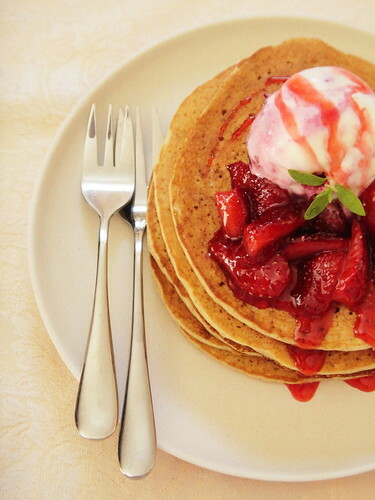 More pancakes and the last of my strawberries on this glorious Day 20 of the Nestle breakfast challenge. I found the idea of cutting my pancakes into heart shapes really cheesy and was more comfortable with the conventional round shape. The only other change I made was to replace the eggs with banana puree and my pancakes puffed up impressively so I had no qualms going egg-free here. 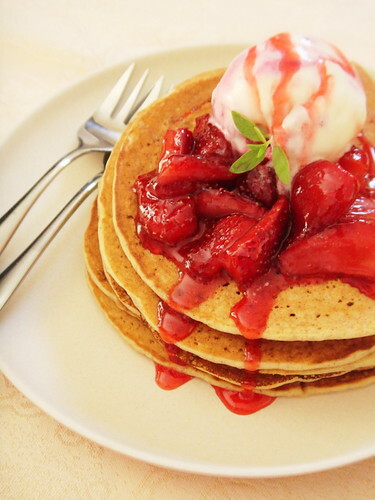 Do not skip the strawberry sauce, I repeat, do not skip the strawberry sauce, else the precious effort of getting up early to make these special pancakes will be, to a large extent, wasted. In a medium bowl, whisk together the dry ingredients. 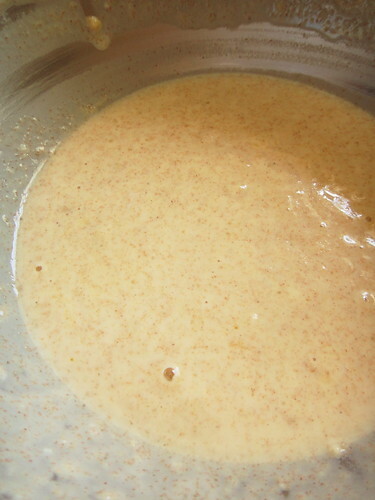 In another bowl, combine mashed banana, water and vanilla. 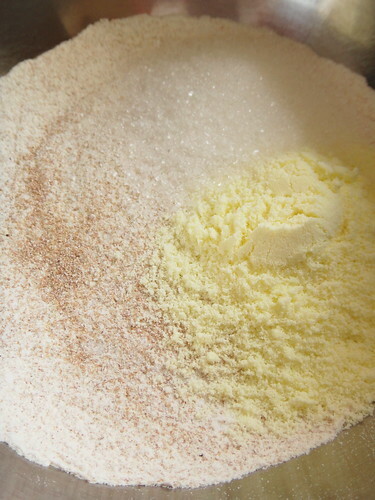 Stir wet ingredients into dry ingredients, mixing only enough to combine them. The batter will be somewhat lumpy. Use a 1/4 cup to ladle batter onto a hot skillet or frying pan and cook until bubble break onto surface of pancake. When the bottom turn golden brown, flip pancake with a spatula and cook on the other side for about 1 minute. 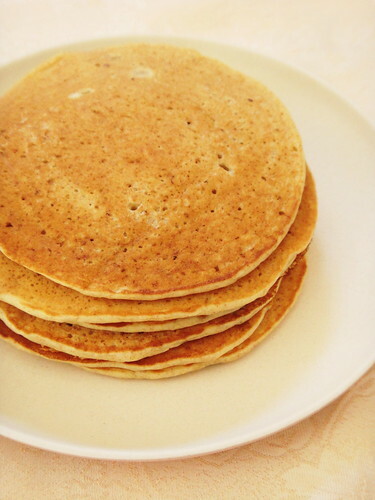 Repeat with remaining batter and stack pancakes on a hot plate. 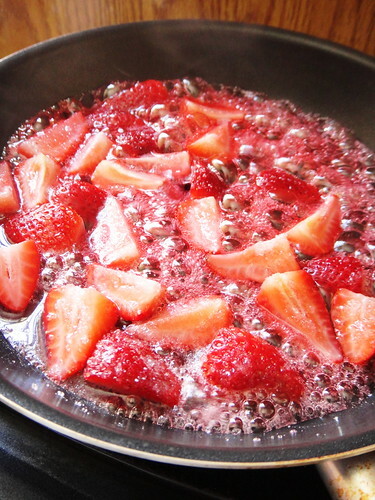 In the mean time, prepare the strawberry sauce. 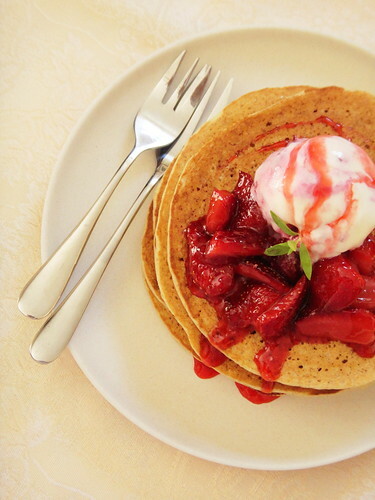 Cook strawberries with sugar until soft and jam-like in consistency, cook slightly and stir in vanilla paste. 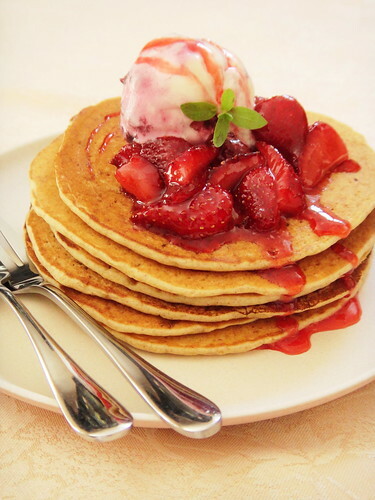 Serve the pancakes warm with strawberry sauce and a scoop of vanilla or berry ice cream. Makes 4 servings. 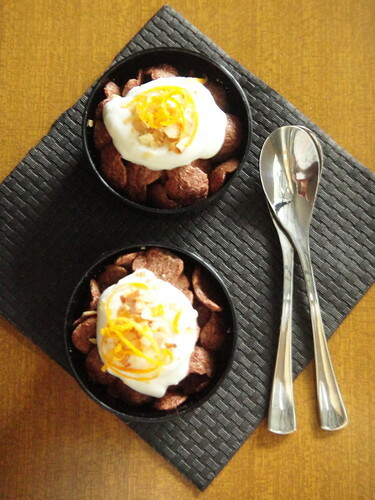 I guess the real challenge of these Nestle breakfast recipes was to find a substitute for bananas whenever I had to use them in smoothies or cereal bowls. Strawberries were usually the ones who came to my rescue mainly because they were undeniably more colourful, if not, more photogenic. 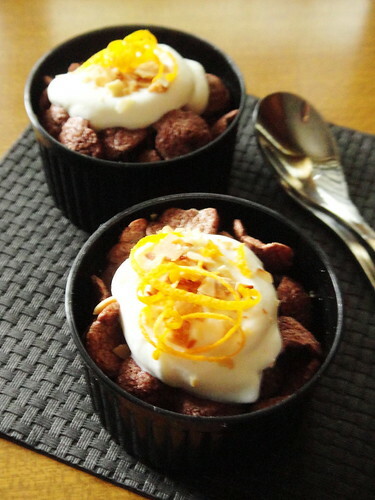 Day18 was yet another repetition of the hated yogurt- banana combination and I think my Koko Krunch bowl looked [and tasted] way better with a good measure of whipped cream and freshly grated orange zest. 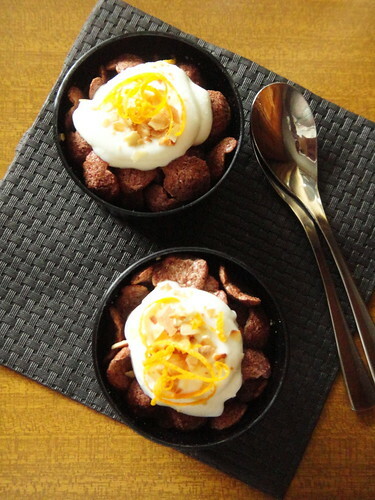 Place the Koko Krunch and freshly whipped cream in a large breakfast bowl. 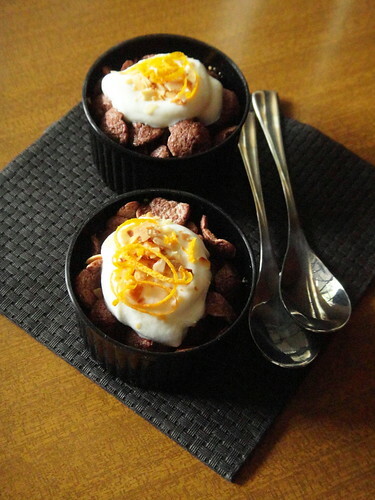 Top with almonds flakes and orange zest and serve immediately. For 1 person.